Last year around the Thanksgiving period, I had the opportunity to visit the United States Air Force Academy and wrote an article about this wonderful experience . . . and expressed the intent to eventually visit the other military academies as the founder and owner of USA Patriotism! Well, shortly after the first of the year, I reread several of my poems about our great country including, One Nation Under God and If America Had Never Been, and realized that I needed to really experience America and start sharing my trips with all who visit USA Patriotism! great country too, and especially all that is uniquely American. So, about a month ago I began my Experiencing America saga . 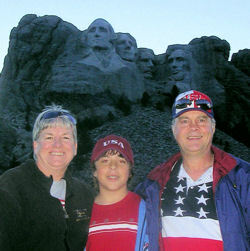 . . spending two weeks with my wife and my oldest grandson (12 years old) driving over 5000 miles through twelve states to visit what I had yet to see in person . . . and few places that I haven't visited for way too long. Now, before you start shaking your head about driving all these miles, flying and renting cars were strongly considered. However, my wife and I felt that our grandson should see all these miles and each state from a car . . . starting from Houston, Texas and going to Mount Rushmore, Yellowstone, Great Salt Lake, Las Vegas (Wayne Newton), Hoover Dam, the Grand Canyon, and other wonderful places along the way. Never being in Nebraska or South Dakota before, my wife and I were both surprised by the relative flatness of the very green, openness of Nebraska that quickly changed after entering South Dakota with mountain peaks over 6,000 feet in its western part where Mount Rushmore is located. Our memorable visit to Mount Rushmore National Memorial was worth every minute . 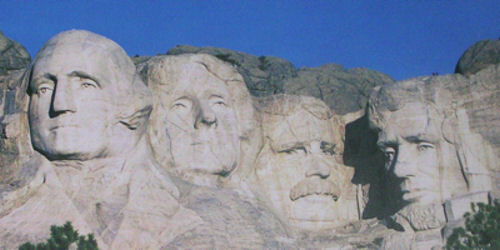 . . and seeing the 60 foot chiseled faces of the four great Presidents in person cannot adequately be described. You truly need to see them in person to grasp their magnificence and the patriotic pride instilled. Even the look on the faces of visitors from other countries brought a feeling of pride knowing that they were experiencing one of the greatest symbols of America. I also recommend to arrange being at Mount Rushmore's lowering of the flag ceremony that occurs at night (around 9pm). 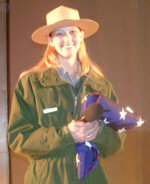 The lowering of the flag ceremony was especially moving for me (and I suspect for all) as park ranger, Sommar Chaffee (photo right), gave an inspiring presentation about the circumstances that led to Francis Scott Key writing the Star-Spangled Banner that eventually became America's national anthem. Spending time at Custer State Park, adjacent to Mount Rushmore, is a must, as well. And taking the scenic route to Mount Rushmore from Custer State Park is a wonderful way to see the Presidents coming out of several well placed tunnels. Note: There is a mountain side chiseling of Crazy Horse that is between Mount Rushmore and Custer State Park. It is actually larger than a President's face on Mount Rushmore. Right now, only the face of Crazy Horse is viewable, but will eventually include him riding a stallion.